Sign-up today and receive free and immediate access to three recently published special reports. 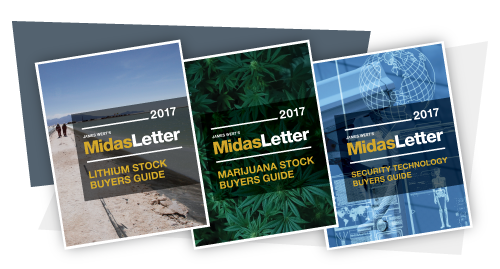 When you subscribe to the Midas Letter you will be exposed to top performing investments. My inclination toward investing in and covering Canada’s Emerging company segment is based on an affinity for and love of entrepreneurialism, and the ‘never say die’ spirit that embodies it. All mega-cap, multinational, blue-chip stocks began life as a startup. Without a steady flow of new companies up the economic ladder into profitable enterprises ripe for acquisition, the mega-caps would stagnate and die. Start-ups are where all the big ideas are born. It is in start-up companies that visionary leadership ignores the naysayers in single-minded pursuit of an idea that is worthwhile, and usually a benefit to humanity. With start-ups, I can easily reach management. In fact, I’m on a first name, call anytime-basis with probably two-thirds of all TSX Venture CEOs in Canada. The financial statements are uncomplicated and no forensic mindset is required, as is the case with mega-caps, where ‘off-balance sheet entities’ were born. While it is indeed a verifiable statistic that 90% of start-ups ultimately fail, therein lies both the challenge and the opportunity. It is only among emerging companies that one can light upon 1,000 percent gains. For every 9 out of ten companies that will fail, a disciplined approach to the segment can easily generate outsized returns that more than compensate for the majority of losers. My approach is simple and proven.